Ever wonder how the pros get their pitches to take one or two bounces and stop dead a few feet from the hole? It's not magic — it's spin. But the Tour guys also don't have a monopoly on it. You, too, have the power to make the ball check up and grab. Start the swing by hinging your wrists abruptly on the backswing, then bring the clubhead down on the ball with as much acceleration as you can muster. 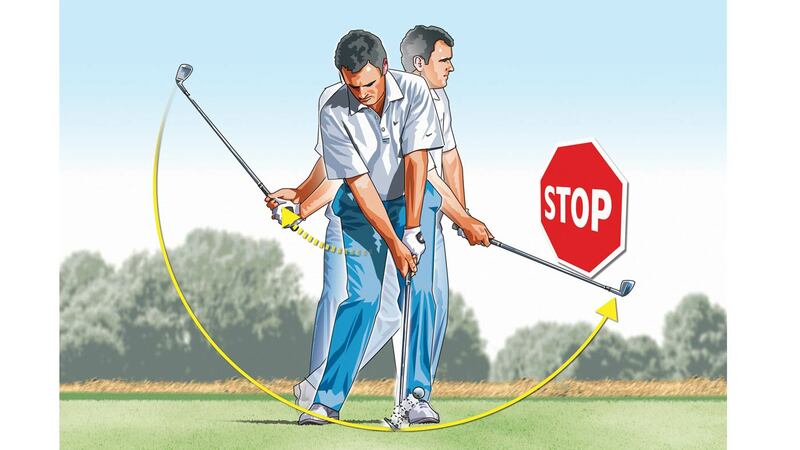 Forget about following through — accelerate the clubhead as fast as you can and stop it just as quickly — this will force the ball to run up the clubface and grab the grooves, and that friction is what gets the ball spinning — and stopping — in a hurry. 1. Hinge your wrists quickly in your backswing, then accelerate the clubhead just as quickly down into the ball. 2. Don't follow through on these shots — an abrupt finish will create the friction between the clubface and ball that's necessary to create lots of spin.